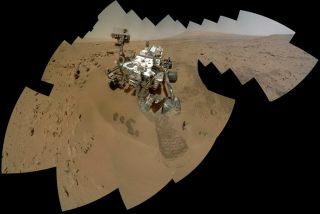 NASA featured the latest Curiosity portrait as its image of the day Thursday (Dec. 27) after releasing the photo earlier this month. This self-portrait of NASA's Mars rover Curiosity shows the rover's stunt double on Earth at the Jet Propulsion Laboratory in Pasadena, Calif. Scientists used the test rover to check photo instructions for Curiosity's full self-portrait on Mars. Image released Dec. 11, 2012.